Taste your way through Portland’s bustling downtown on a food tour with a local guide. You’ll visit both established favorites and trendy food carts to sample a variety of dishes, ranging from fresh made pasta, duck confit, smoked seafood dishes, pork mole to falafel, locally made chocolate, salted caramel ice cream sandwiches and more, all washed down with regional craft beer, cocktails and Oregon wine, of course. As you walk, learn about the area’s art, history and culture from your knowledgeable guide. This tour is offered a variety of days and times throughout the week, so check the calendar for full availability! And we are excited to announce this tour features a stop at the Portland Farmer's Market at Portland State University on Saturdays during the summer. This food tour is limited to about 12 people, ensuring you enjoy a small-group experience. Your food walking tour of downtown Portland begins and ends with your guide, stopping at some of the most popular restaurants and food carts in the neighborhood. 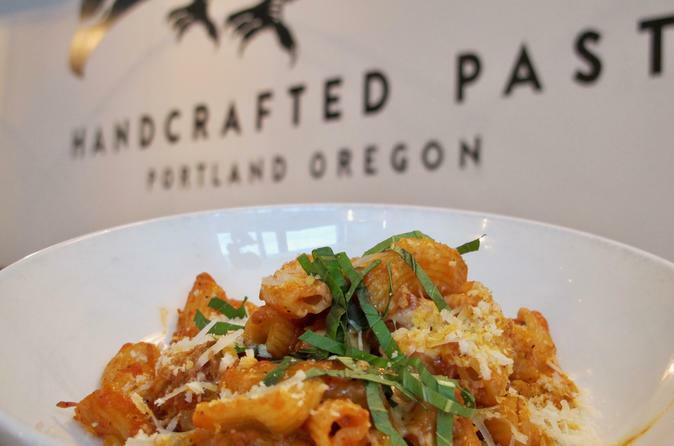 Exact itineraries vary slightly each day, but you can expect an array of food and drinks enjoyed at locations that show you the wide range of Portland’s culinary scene, from upscale eateries to casual classics to sweet shops. You may try smoked fish paired with local cider, a Mexican dish that only uses ingredients from local farmers markets, handmade dumplings, the best falafel in town, single-origin chocolate, a glass of Oregon wine or a drinking chocolate. In between stops, pass by local attractions and hear from your guide about the area’s history, perhaps how the Pearl District evolved from a warehouse quarter to one of the city’s trendiest neighborhoods or how Portland got its name. Your tour ends at a local dessert spot, a perfect way to end a delicious tour!